Students will become aware of an ancient writing system. Use a phonetic reference resource to spell their names using hieroglyphic characters. 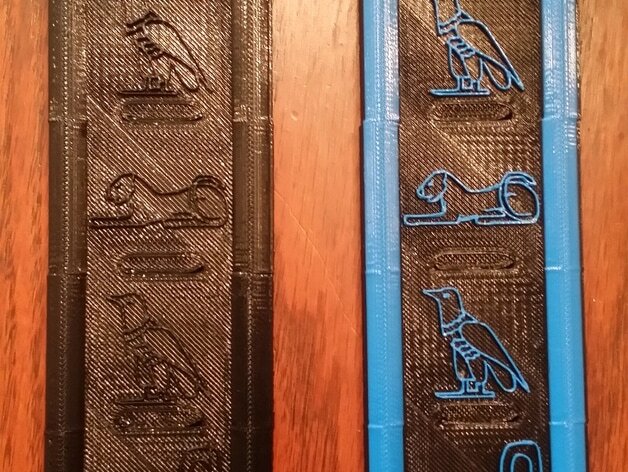 Students will practice translating their names from English into hieroglyphics and back again. You will gain a knowledge of the importance of writing in ancient Egypt through translating your own names into hieroglyphics and embedding them in a Cartouche which was usually reserved for people of importance in Egyptian society. Ancient Egyptian appeared more than 5,000 years ago making it one of the earliest recorded written languages and was in use from about 3200 BC until the late 4th century AD and changed very little. Ancient Egyptian was a picture language with some pictures representing letters, others representing objects, and still others representing ideas. Through the ages though, the meanings of the hieroglyphs became lost. When archaeologists discovered hieroglyphic writing on the walls of tombs they could not read it. They knew the pictures had meaning. But the best they could do was to guess what those pictures meant. It wasn’t until the discovery of the Rosetta Stone that all this changed. The Rosetta Stone is a stone carved in three languages: Egyptian, Demotic and Ancient Greek. Inscribed on it was a short story. The same story was written in Greek, in Demotic script, and again in hieroglyphics. Scientists could read Greek. 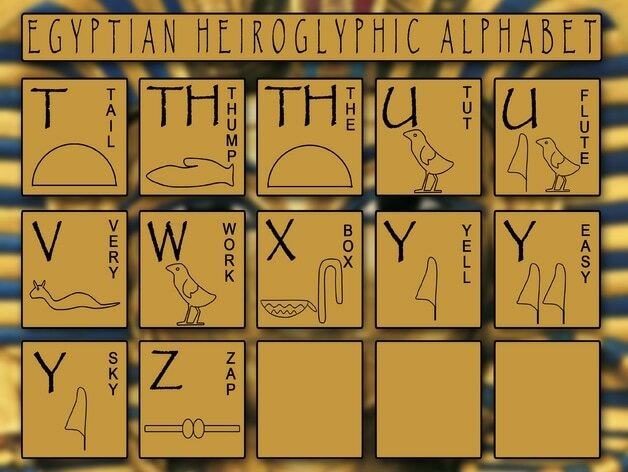 Using this a gentleman by the name of Jean-Francois Champollion performed the translation and they could now read hieroglyphics. ​His job was made a little easier because the ancient Egyptians surrounded royal names with an oval call a cartouche. There were many royal names surrounded by a cartouche. But there were two names in Greek - Ptolemy and Cleopatra. Champollion's job was to find those two names in the hieroglyphics which he did. A Cartouche is like a nametag and was used to identify important people in Egyptian society like the Pharaoh who Egyptians considered a living god-king. 1. 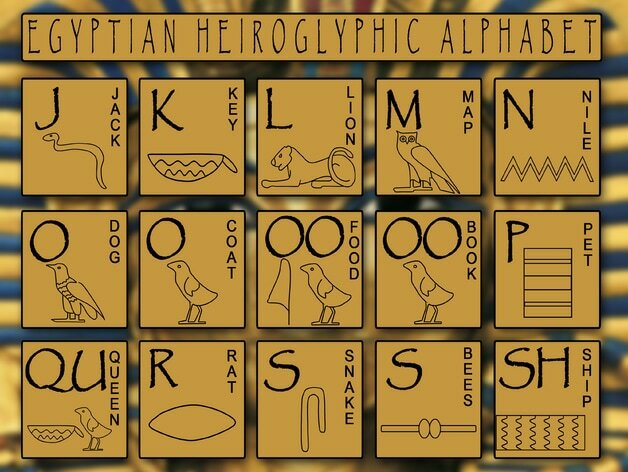 View the Egyptian Hieroglyphic Alphabet tables below, each symbol represents the letter next to it. 2. 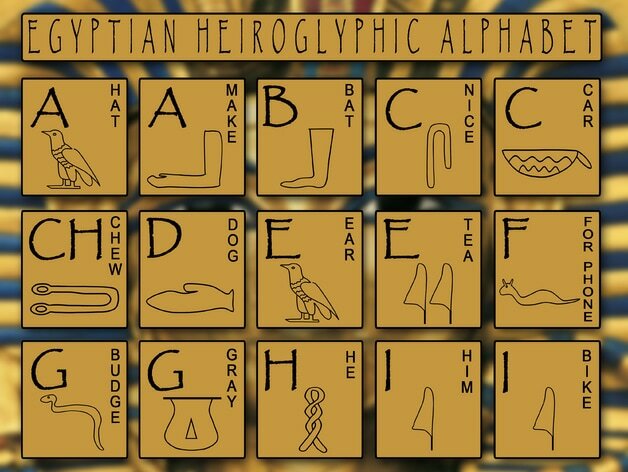 You will now look at the hieroglyphics table and find the English letter equivalents of your name. 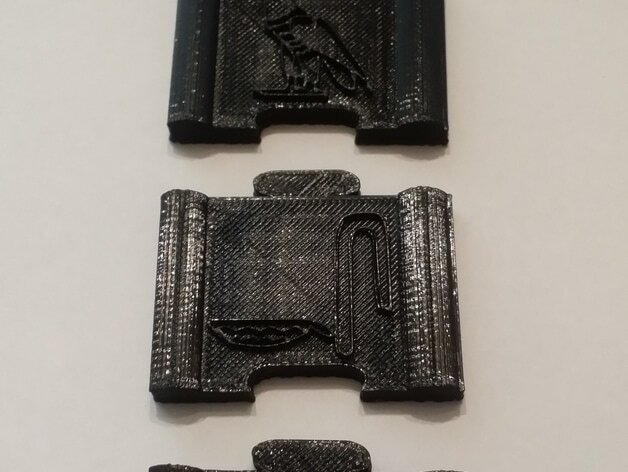 In Tinkercad or Makerware desktop software you can arrange the tiles together and print as a single unit.